Anthony Blackburn has been in business for 28 years and runs a productive and very profitable appraisal business. He knows that efficiency is the key to his profitability. Because he tracks and measures the time it takes to perform every step in his appraisal process, he knows that ClickFORMS Appraisal Software makes him more efficient and productive. See how Anthony Blackburn of Apple Appraisal, Inc. was able to streamline his appraisal business with the use of ClickFORMS. Watch our interview to learn about the tools and services in ClickFORMS that allows Apple Appraisal to complete an appraisal in a fraction of the time it takes to complete a standard report with other software. 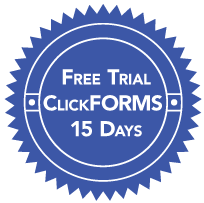 Try ClickFORMS Free for 15 days. Discover all the efficiency and productivity that's possible when the appraisal software you're using is simple and intuitive. Easy to use doesn't mean that ClickFORMS lacks the features you want and need. Sophisticated features are built right into Clickforms. Try all the time-saving features of ClickFORMS and get free technical support for 15 days — no hassle, no risk, no obligation. Enter your email address to get started.